The important first plan of New York City's Central Park - predates Olmstead and Vaux. Map of the Lands Included in The Central Park, from a Topographical Survey, June 17th 1856. Plan for the Improvement of The Central Park, Adopted by the Commissioners, June 3rd 1856. Two extremely rare 1856 pre-Design Competition plans of Central Park drawn by the park project's first engineer-in-Chief egbert Ludovicus Viele. Both plans extend from 59th street to 106th street, taking in the original grounds reserved for Central Park, as well as some of the adjacent streets and avenues. Viele's printed signature appears in the lower right quadrant of both maps. These maps are accompanied by the original January 1st 1857 First Annual Report on the Improvement of The Central Park, New York, which they are intended to illustrate. This book is inscribe by Viele - his signature unmistakable - to one Frank Tuthill, a prominent Brooklyn based doctor and New York Times editor, and an avid supporter of Viele's sanitation theories. While the work of acquiring the land and displacing the current residents fell to the City Council and New York Police Department, the work of preparing the grounds fell to the radical civil engineer egbert Ludovicus Viele. Viele, who was completing a topographical survey of New Jersey under William Kitchell, was assigned to be the first 'engineer-in-chief' of the Central Park Commission. Viele held the radical though not unfounded belief that epidemic level disease evolved from excess moisture in the soil. His topographical experience combined with his passionate advocacy for open public spaces, proper drainage, and clean air, made him the ideal force to define New York City's proposed Central Park. By 1856, with most of the former inhabitants cleared out, Viele assembled a team to survey and define the future park. He divided the reserved lands into five sections to which he sent separate teams to survey, identifying every standing building, rock, hill, stream, valley, road, and pasture. The result is the upper to the two maps currently offered. This is a topographical survey of the park lands as they appeared just prior to the park's construction. Viele identifies various dwellings, including the impoverished squatter camp on east 83rd street known as Seneca Village, the old 'Receiving Reservoir' (currently the Great Lawn), the proposed site of the new reservoir (currently the Old Croton Reservoir), and the Mount St. Vincent Convent - which was subsequently relocated to the Bronx, where it still exists. This important plan, not only enabled Viele to provide the city council with cost estimates for preparing the land, it also served as the basis for all subsequently proposed plans for Central Park, including Viele's own plan, discussed below, and the ultimately victorious Olmstead and Vaux plan. 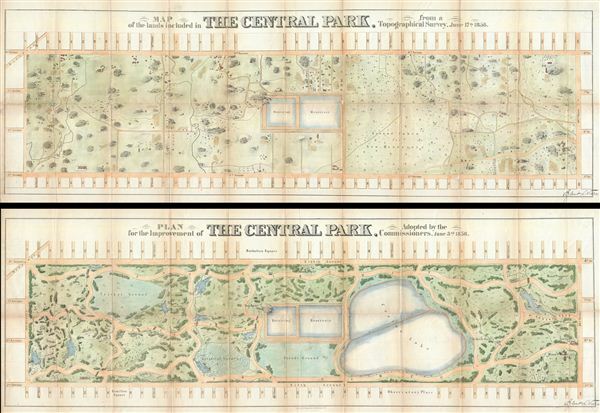 The second map, the lower of the two illustrated above, is the first actual plan of Central Park. Central Park is famous for the historic 1857 design competition that catapulted Frederick Law Olmstead from a relatively obscure garden designer to the world's best known landscape engineer. However, one year before this contest, egbert Viele had already produced his own design for the Central Park, what he considered a 'harmonious blending of all that is beautiful in light and shade, in color, size and shape.' He attached the design to his topographical map, both of which accompanied his report to the city council. As the engineer-in-Chief of the Central Park Project, Viele had an enormous impact on the overall design and layout of the park. While Viele's plan of the park is instantly recognizable, a closer examination will reveal that this is not, in fact, the modern Central Park. Nonetheless, this map had a profound influence most subsequent park designs as it set various legislative directives that all entries to the Central Park Design Competition were require to comply with. These included four or more park transverses, a large parade ground, various children's play areas, a fountain, a skating pond, and a lookout tower, among other many other features. Most of these elements made their first appearance on this map by Viele. Although the plan submitted by Frederick Law Olmstead and Calvert Vaux, nearly a year after the publication of Viele's Plan for Central Park, was the ultimate winner of the Central Park Design Competition, all competitors would have had the opportunity to examine both of these important maps. While there are a number of notable differences - for example most latter plans of Central Park adopted the proposal to extend the park to 110th street, Viele's ended at 106th - it is no trick that the Viele Plan is instantly recognizable as Central Park. The groundwork established here by Viele, almost as much as Olmstead's brilliant vision, defined the modern day Central Park. Today, because of Viele, Vaux, Olmstead, and others, New Yorkers, ourselves included, have the privilege of enjoying what is, perhaps, the finest example of a planned urban public recreation area in the world. Egbert Ludovicus Viele (June 17, 1825 - April 22, 1902) was an American civil engineer and cartographer active in New York City during the second half of the 19th century. Born in Saratoga County, Viele attended the United States Military Academy at West Point. Graduating in 1847, he was commissioned as a brevet second lieutenant in the 2nd United States Infantry. He served in the Mexican-American War before resigning form military duty to pursue a career as a Civil Engineer in New York City. When the call came to plan New York City's Central Park, Viele, like the ultimately victorious Vaux and Olmsted, submitted a plan. Though Viele's plan for Central Park did not win the design competition, it did bring him to the attention of the city council, who hired him as Engineer-in-chief of Central Park in 1856, and engineer of Prospect Park, Brooklyn in 1860. It was most likely during his tenure with the park commissions that Viele developed his theories connecting compromised natural drainage with sanitation and infectious disease. Viele's great cartographic masterpiece, the "Topographical Map of the City of New-York" evolved out of the notion that epidemic level disease evolved from excess moisture in the soil. He contended that, as New York City expanded northwards, paving over stream beds and leveling out natural drainage channels, the underground waterways would stagnate and lead to plague or worse. Though intended for the purpose of urban planning, the Viele Map's (as it came to be known) greatest legacy is as a construction tool. To this day, contractors, architects, and engineers consult the Viele plan to determine if unseen subterranean waterways need to be taken into account when preparing foundations. Viele died in April of 1902 and was buried in an elaborate Egyptian Revival tomb at West Point. Legend tells that Viele, paranoid that he would be buried alive, an unfortunate but surprisingly common problem in the 19th century, installed a buzzer inside his coffin that would allow him to ring the school's commanding officer should the need arise. Apparently it did not, though Viele lives today through is remarkable "Topographical Map of the City of New-York." Viele, E. L., First Annual Report on the Improvement of The Central Park, New York, (New York: Baker) 1857. Very good. Some toning and wear on original fold lines. Blank on verso. Backed with archival tissue for stability. Size given is for each map independently, both are the same size. Haskell, D., Manhattan Maps A Co-operative List, 1029. Deák, Gloria Gilda, Picturing America: 1497-1899, Vol. 1, pp. 535-536. Rosenzweig, R., and Blackmar, E., The Park and the People: A History of Central Park. New York Public Library, Map Division, digital ID: 1697276.